This complimentary webinar informs attendees about the following membership opportunities: Innovation Abstracts, The NISOD Papers, #NISODProfiles, and Member Spotlights. 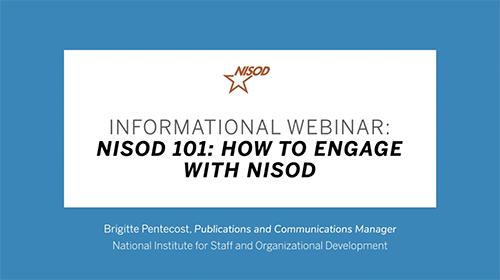 NISOD’s Publications and Communications Manager, Brigitte Pentecost, will facilitate and answer questions on how to get more involved with NISOD. This webinar is free for both members and non-members to attend. Only those attending the LIVE webinar will receive a certificate of attendance. Thank you!